With the current unstable economy, menus are squeezed dry to cut out expensive ingredients, a typical case of price goes up and quality goes down. This is why I don’t like lunch sets — they are often a poor shadow of the real deal. A friend of mine recommended that I tried Pastis Cafe, but I was hesitant. See, he is someone who is easily pleased, whereas I can be extremely fussy when it comes to food. “How good can the food be, and what more, lunch sets?” I asked. 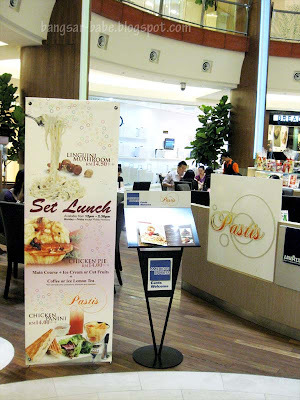 Located at the ground floor of The Gardens Mid Valley (outside Isetan), Pastis Cafe has a so called “open kitchen concept” that allows diners to watch their food being prepared. 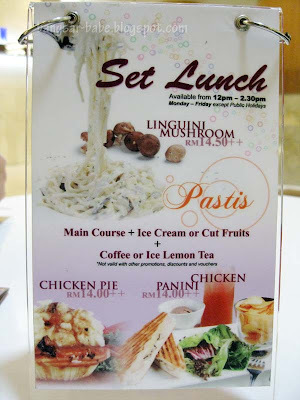 The lunch set is priced at RM14++, which comes with a choice of pasta, pie or panini sandwich, coffee or ice lemon tea and a scoop of ice cream (chocolate, vanilla or strawberry). I opted for the chicken pie, which came with a scoop of mash potatoes, mushy peas and mushroom sauce. I expected it to be sub-standard, but it was surprisingly not bad. I half expected the pie to be hollow, but it wasn’t. 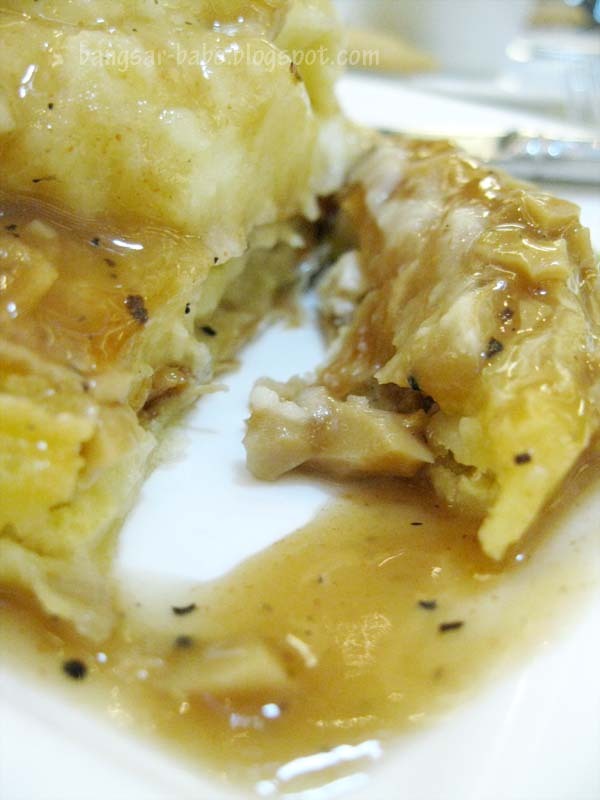 Although it wasn’t stuffed to the brim, it had a decent amount of filling — tender chicken chunks in a thick, creamy and deeply flavoured gravy, encased in an airy puff pastry. 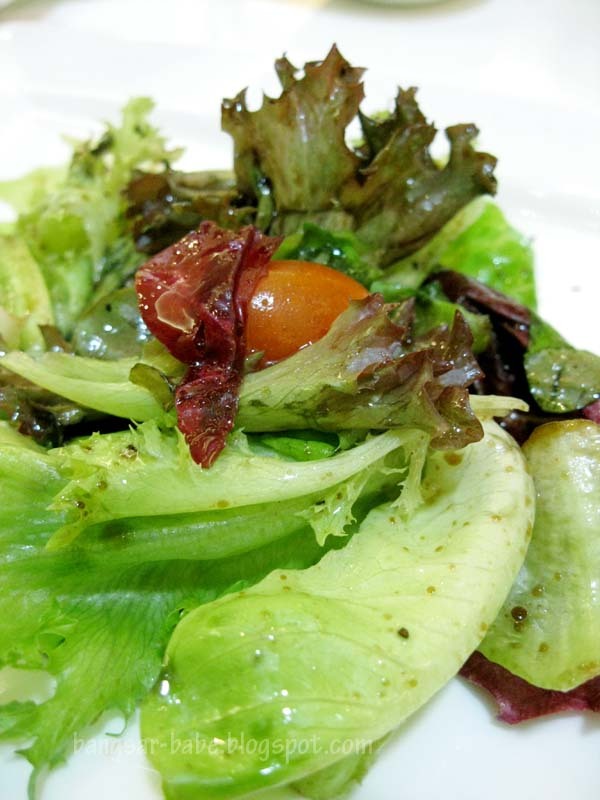 The green salad, tossed with a simple balsamic vinegar dressing was too plain. I didn’t care much for this. Give me thick cut fries and that would be another story altogether. I liked my lunch set, but found the portion rather small. I could have eaten 2 whole pies easily. Mention Strawberry Shortcake and I would assume it is a biscuit based cake with strawberries and cream on top. Pastis’ version (not included in the set lunch) was a golden sponge cake with two layers of cream and strawberries in between. A quick search on Google revealed that the strawberry shortcake can either be the biscuit or sponge version. The cake (RM11.80, discounted price – RM5.90) was moderately sweet, and the thick white chocolate icing paired well with the buttery sponge layers. 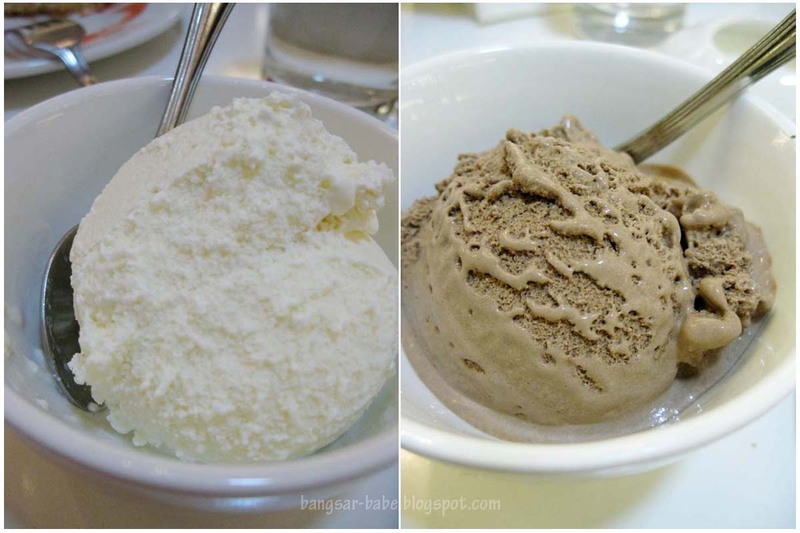 Not bad, but I prefer the denser, biscuit-like version. Pastis usually has a cake promotion, where selected cakes are at a 50% discount. The ice cream was nothing to shout about, but it was a nice nice compact scoop with a creamy texture. I found the coffee quite decent. 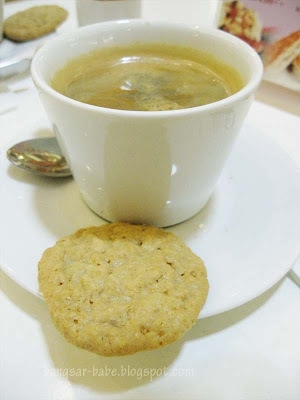 Topped with a layer of crema, it was smooth, rich and robust in flavour. I liked the cookie it came with, which was crunchy with a hint of coconut, and shamelessly nicked Shum and Hanim’s cookie. Service was alright. The customers were greeted warmly, and although some of the staff didn’t speak much English, there was always a smile on their faces. One forgivable slip was when I was asked to not take photographs of the restaurant. I was peeved (because I know bloggers have been here and taken loads of pictures), but the manager quickly apologised when she found out I was taking pictures of their cakes, and not their food preparation process. 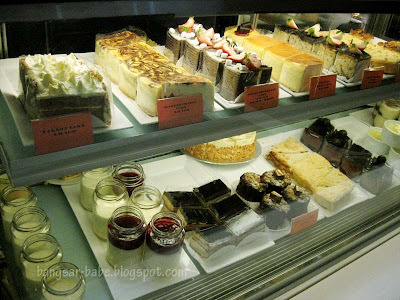 Verdict: Drop by for decent food and cakes, and service with a smile. 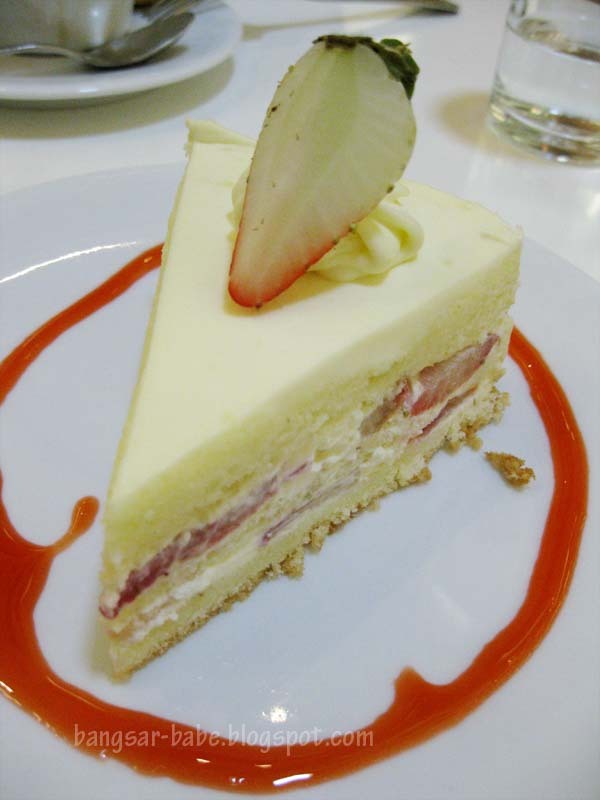 the price of the cake obviously is where they try to recover their costs for the set lunch..
Ahh..strawberry shortcake – saw it at Pattiserie RUI but I must say this one looks better! RM14 worthy lah … previously almost every outlet in The Gardens was charging an arm and a leg for lunch. took you long enough! 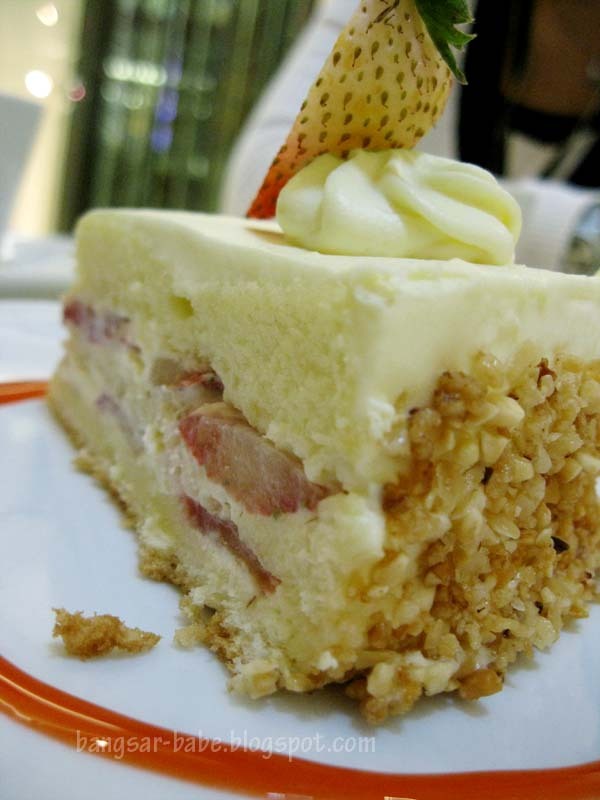 the last time i dropped by (2 weeks ago) the strawberry shortcake was on promotion for RM4 – 5 per slice. notice the terms and condition, lunch set is only available from Monday – Friday except public holiday. this set lunch is designed for those ppl working in MV or students on holiday, not sure how much you earn (or pocket money you receive) but reasonableness depends from person to person. for me eating here ONCE in a while can LAR. Not sure if our earning power is low or the stuff in Malaysia is expensive. If you compare dollar to dollar, the set would be 3GBP or 6SGD or 4.5USD while earning the same AMOUNT of salary. OK OK! if Jenn & I ever shop at Isetan.. maybe we should drop by your lunch! Oh good to know! I'd pretty much written off any of the hoity-toity places at Gardens, since nothing's good been said about them. But the pie looks good enough for me! Ah… a lesson abt shortcakes, thanx! 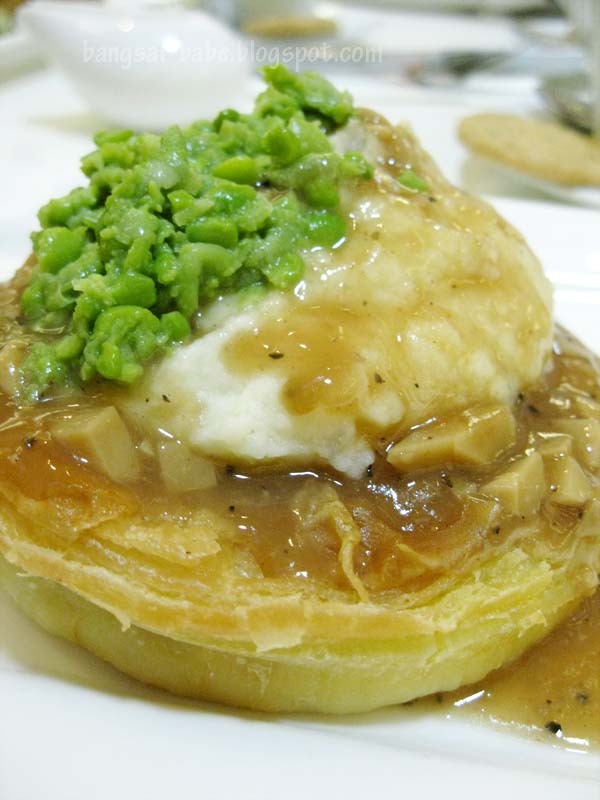 ps – Mash potato on ANYTHING is nice 🙂 espesh SHEPERDS PIE!! 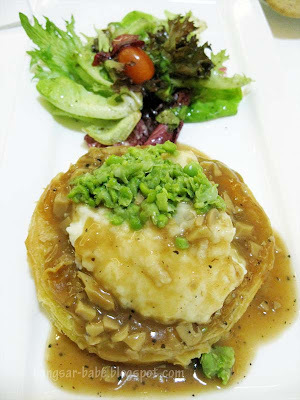 Julian – Yup…mash potatoes on shepherds pie….yum! Christine – Go try next time! 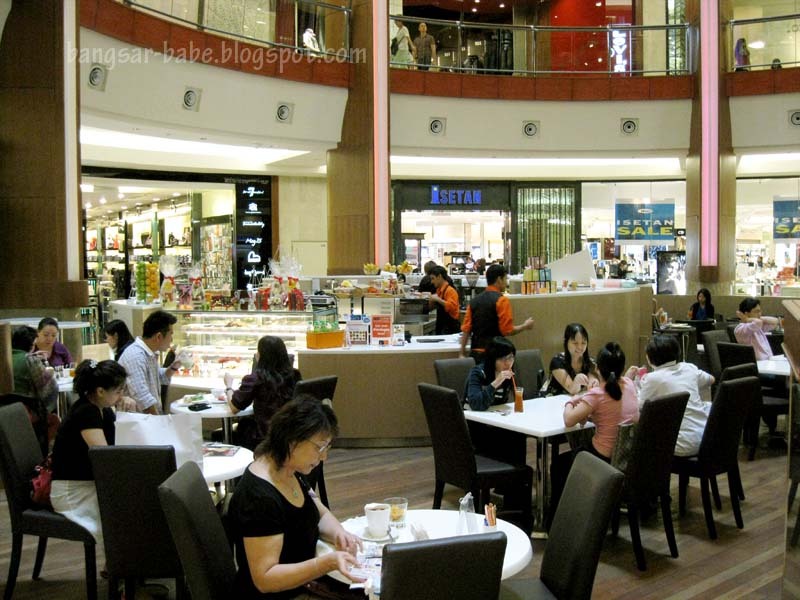 leo – It's a nice place to unwind after shopping. I'm eying on their afternoon tea set already! 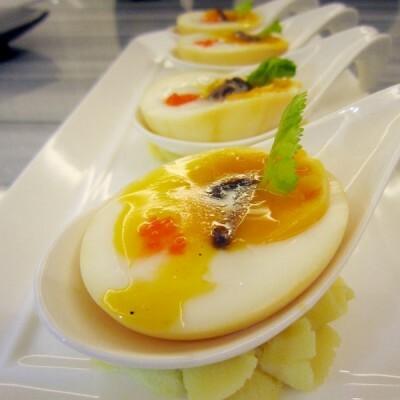 kampungboycitygal – I heard Ko Hyang is quite good, but it's always so crowded! 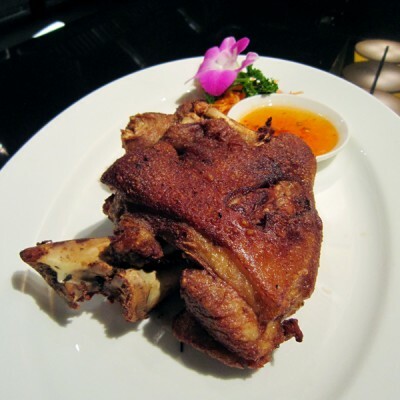 nomad – No wor…Chinoz is still at the Robinsons side. Joe – For the other cakes maybe. The strawberry shortcake was on 50% discount. Wilson & Rachel – Tasted pretty good too. I visited Pasties in The Gardens, Mid Valley, in November 2014, with my wife and father-in-law. We ordered dinner and the waiter did not even look at us when we were giving him our order, his eyes were fixed on his notepad. When he was done taking our order, he just took the menus from our table and walked away, without uttering a single word. Rudeness is one thing, but it’s what happened when my wife handed her credit card over to another waiter that was far more serious. This waiter took my wife’s credit card and I was keeping an eye on him. All he had to do was swipe the card in a machine and bring the bill and credit card back to us. But what he did was take the card and walk towards the counter where the swipe card machine was and he stayed behind the counter for a full three minutes. Suspecting that something was not right, I walked towards the counter (the waiter couldn’t hear my footsteps cause I was wearing rubber-soled shoes and his back was turned towards me so he couldn’t see me walking towards him either) and I was taken aback to see that he was writing my wife’s credit card details on a piece of paper ! When I asked him what he was doing, he smiled at me and said that he was having difficulty swiping my wife’s card. That was pure nonsense. He pretended that he had finally managed to swipe the card and a bill was generated by the computer but I ordered the waiter to hand over my wife’s card and the bill over to me, and I brought the card and the bill over to my wife so she could sign it. Then I gave the waiter the bill and he handed a copy back to me. I know that he knew that I suspected him of copying my wife’s credit card details. When we left the cafe, I told my wife what had just happened and she wanted to go back to the cafe and speak to the manager about this matter but I persuaded her to simply cancel the credit card by phoning the credit card company and informing them that the last transaction was genuine, and she did just this when we got back to our hotel room. 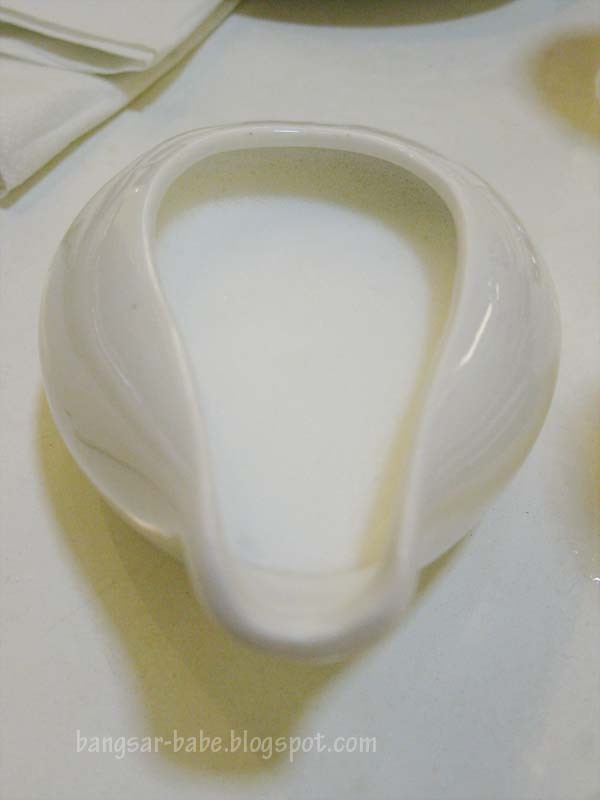 I would like to warn customers of Pastis at the Gardens in Mid Valley in Kuala Lumpur to be very careful when handing over your credit or debit card to the cafe staff and keep an eye on what they are doing.